Capital Distributing Has It All. 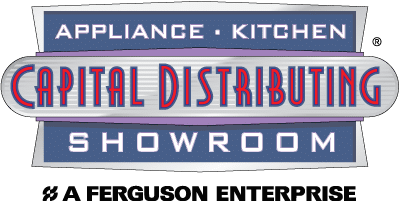 AND CAPITAL DISTRIBUTING IN DALLAS OFFERS THE FINEST BRANDS AND SERVICES. If you’re planning a kitchen remodel, watch our video to ensure you consider your appliances first. Refrigeration refrigeration’s purpose is to preserve foods and beverages and/or provide ice. Built In-Full Height refrigerators, freezers and wine storage are generally 80” to 84” tall and engineered to be completely enclosed within a cabinet that is generally 24” in depth. They can be a refrigerator, a freezer, wine storage, a combination refrigerator and freezer and/or wine storage and are available in many different widths. Some manufactures offer refrigeration that can be completely integrated in the cabinets to conceal the appliance. Built In Under Counter refrigerators, freezers, wine storage, ice makers and combination of those are engineered to be completely enclosed within a cabinet that is generally 24” in depth and fit under a countertop. Counter Depth refrigeration are designed to be inset into a cabinet enclosure that is generally 24” in depth with the refrigerator’s sides being covered and only the door protruding outside the cabinet. They are most common in a nominal 36”width but some manufacturers offer these refrigerators in other widths. Free Standing refrigerators and freezers are designed to have both sides exposed and the sides are generally much deeper than the countertop. Dishwashers and Cleanup appliances that clean, sanitize, store or dispose. Let us show you the dishwashers that don’t require that you pre-wash them before loading, are easy to load and unload and have great style. Dishwashers should clean and sanitize your dishes, utensils and glassware without pre-washing. We also offer a residential dishwasher with a 10 minute wash cycle that sanitizes for those who love to entertain. Trash Compactors can compact and store your waste and fit under the counter top. Disposers should be relatively quiet yet powerful. Cooking a great cooking appliance is stylish, offers the features and performance great chef’s desire. Ranges or commonly called stoves are a combination of an oven and surface cooking. The most common widths are 30”, 36”, 48” or 60” wide. The 48” and 60” widths usually offer 2 ovens. Ranges can come in all gas, all electric or combination of gas and electric which are known as dual fuel ranges. Some manufacturers offer other widths and a variety of configurations with griddles, grills and woks. Cooktops are designed to set on the surface of a counter top that has a cutout for the cooktop’s body to recess into. Cooktops come in gas or electric varieties such as radiant, induction, disk or coil models. The width combinations can vary extensively when modular combinations are utilized. Some manufacturers offer countertop steamers, fryers, woks, grills and griddles. Range tops are the upper surface cooking of a pro range without the oven below. They generally mirror the combinations of pro range widths and combinations. Wall Ovens are designed to fit into a wall cabinet or in a cabinet under a countertop. Most wall ovens are electric although some manufacturers offer gas, combination oven and microwave, steam, speed cook or other options. Microwaves come in built in, under counter drawer or countertop. Some manufacturers offer combination oven and microwave as well as speed cook models. Ventilation is often the most misunderstood and forgotten part of the kitchen. A well designed kitchen includes a stylish hood or ventilator that is properly sized and installed to exhaust grease, moisture and odors. The exhaust fan motor can be inside the hood or liner, on the exterior wall or roof or in-line between the hood and the exhaust point depending on the manufacturer. Wall Hoods hang on the wall above your range, cooktop or rangetop. Wall hoods are usually chimney style or pro canopy style. They usually are connected to a duct that runs to the outside wall or roof. When ducting to the outdoor is not an option some manufacturers offer re-circulating models that filter the exhaust through a filter and reintroduce the filtered exhaust into the kitchen. Island Hoods suspend from the ceiling over a range, cooktop or rangetop. The ducting or re-circulation options are similar to the wall hoods. Insert Hood Liners are the internal portion of a hood that is designed to be enclosed and concealed by a cabinet enclosure or other architectural feature. The ducting or re-circulation options are similar to the wall hoods. Down Draft ventilation is designed to exhaust down below the countertop. This configuration is handy in many applications but tend not to be as efficient as overhead ventilation since heat rises. The ducting must take place below the countertop and exhaust outdoors. Limited manufacturers offer recirculation versions. Specialty Appliances some manufacturers offer unique appliances that offer solutions to fulfill your desires. Let us help you select those unique luxuries for you home. Vacuums We are a vacuum dealer for Miele vacuums.